The largest office-to-residential conversion in the history of New York City is now under way. Macklowe Properties is in the process of transforming One Wall Street, a 56-storey art deco landmark in Lower Manhattan, located to the east of the New York Stock Exchange and Broadway. 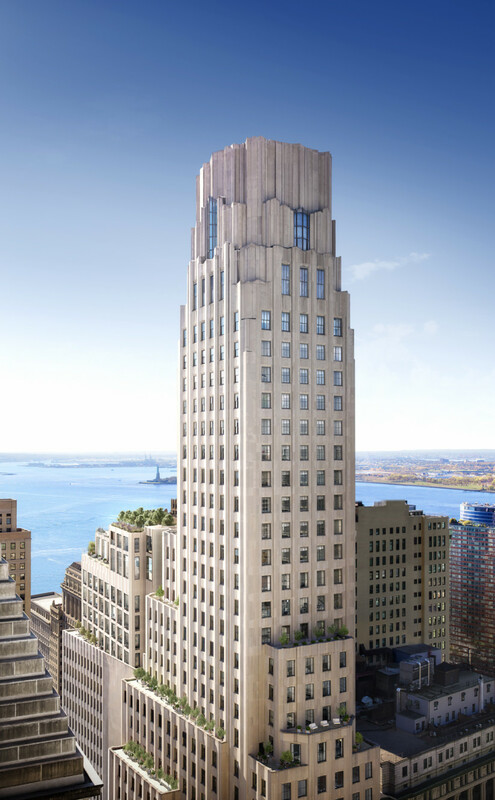 Built in 1931 for the Irving Trust Company and designed by “architect of the century” Ralph Walker, One Wall Street (once completed in 2020) will translate into the most powerful address in town. It stands tall on Wall Street adjacent to the New York Stock Exchange and opposite the Trinity Church, with unobstructed views of the New York Harbour and the Statue of Liberty. It will feature 566 studio to four-bedroom apartments and a penthouse, in addition to 174,000 sq ft of retail space and 100,000 sq ft of amenity space. Despite conversion measures, the building will retain its limestone façade and the “Red Room” that features a 5,000-sq-ft, triple-height floor-to-ceiling mosaic by muralist Hildreth Meière. It will offer 174,000 sq ft of retail space, with Whole Foods occupying the lower-level retail portion of the building with 44,000 sq ft over three floors. Property Weekly speaks to Richard Dubrow, director of marketing at Macklowe Properties, on this larger-than-life residential offering in the Financial District. The soft demo of One Wall Street began in November of 2015. Architecturally or design wise what have been the main challenges to tackle such a huge project? One Wall Street can easily be called the most powerful address in New York. What will be the impact of history on future residents? Future residents at One Wall Street will naturally be drawn to the idea of living in an architectural icon, a grand art deco masterpiece that has the beauty of a museum with wide halls and high ceilings. However, the history of OWS isn’t limited to the architecture of the building — the location is equally important. Downtown is now one of the best-connected neighbourhoods in New York, which makes it and One Wall Street an extremely attractive place to live. How many units are there on each floor? The number of units on each floor varies. There are approximately 32 units per floor at the lower base, approximately 17-21 units per floor at the upper base, 7-12 at the upper portion of the building and two units per floor at the tower (40th floor and above). What are the different unit types? What about the price points? Prices start from $960,000 (Dh3.52 million) for a studio apartment.